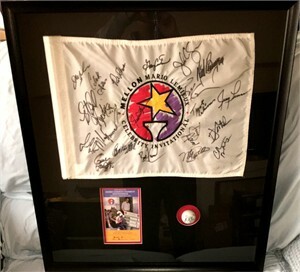 This is the ultimate unique gift for a Mario Lemieux fan: the official embroidered 2000 Mario Lemieux Celebrity Invitational tournament flag autographed in black marker by Pittsburgh Penguins hockey legend and tournament host Lemieux, plus celebrities Charles Barkley, Carlton Fisk, Mike Schmidt, Chuck Cecil, Donny Anderson, Brian Kinchen, John Congemi, Mike Eruzione, Clark Gilles, Darren Veitch, Rollie Fingers, Rick Rhoden, Pierre Larouche (signature bleeding), John Brodie, Truck Robinson, Roy Green, Steve Bartkowski, Gary Carter (deceased), Jerry Lucas, Jim McMahon and Kurt Bevacqua for a total of 22 signatures. 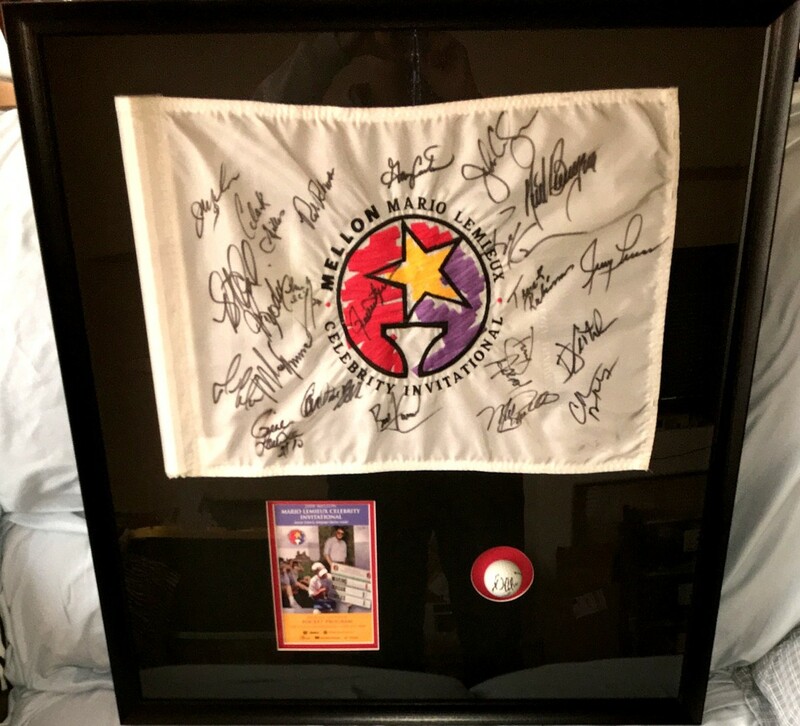 The flag, along with the official tournament program (UNSIGNED) and a golf ball autographed by Lemieux have professionally mounted, double matted, framed and shadow boxed (at a cost of over 200 dollars just for the framing). The entire piece measures about 27 inches wide, 29 inches tall, and 3 inches deep. It is ready to hang. ONLY ONE AVAILABLE FOR SALE. DUE TO THE LARGE SIZE OF THIS ITEM, IT CAN ONLY BE SHIPPED VIA STANDARD SHIPPING TO THE LOWER 48 STATES.